"Wednesdays at Kidderminster College can be quite special. It is not only the day that me, Steve and Andy all converge to teach music and our respective instrumental wizardry. It is also the day that a wandering master musician may drop by to give an inspiring workshop, maybe we will also get to jam together and share some stories. Then there are the days that out of the blue Andy tells me to get in Studio 2 as we will be recording an album. I guess we both owe a lot to Steve when it comes to the art of spontaneous album creation, just check out his massively creative outpouring on Bandcamp to see why, so it is great that this process is rubbing off on me and Andy. Well more so me, giving I have albums that I'm still working on that I started over 20 years ago! So on one such Wednesday Andy tells me Steve is on his way with his full rig and that we are going to record the next Ley Lines album. Now I wasn't at all prepared, for one I didn't have any gear with me, apart from my college guitar which had an issue with the bridge meaning that I couldn't use the whammy bar at all. Well limitations and being unprepared are part of the creative process, so I figured I'll just play in real time through my laptop and use plugins to get my guitar sounds. As it so happens I had just upgraded to Digital Performer 9 as well as Soundtoys v5. The whole recording process became an amazing journey of discovery into delving into what these two amazing sets of software could do. DP9 had just added a series of really cool guitar synth plugins, while Soundtoys had this new effect rack plugin that allowed you to chain effects together to create mind-blowing sounds. Ley Lines II for me was the result of this new guitar recording process, and unlike the more traditional guitar sounds on Ley Lines I, I could now encroach into Steve's mind boggling sound world. There are times were I can't tell who is doing what between us, and with Steve also using his Quneo to add touches of electronic percussion, there are now cross-overs between Steve and Andy. This album is much darker than Ley Lines I and this is also exactly as we played it - totally improvised! Whereas the first LL had a few overdubs and some structural editing to enhance the instrumental song form, this album is an untouched raw and mighty live performance with just some minor topping and tailing to edit out gaps and waffle between pieces. 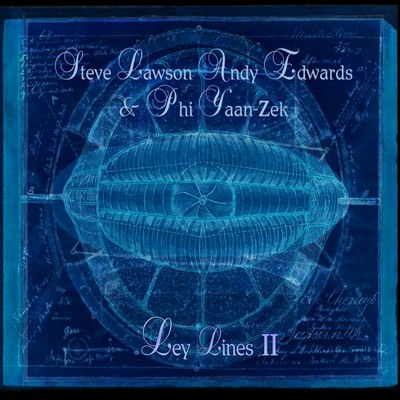 Yes it is a dense and intense yet very rewarding listen, and also goes to show how much me, Andy and Steve have gelled together as musicians in the year since the first Ley Lines. I'm still amazed how the music morphs into strange new avenues along the way, from sublime ethereal soundscapes to dark netherworld fusion. For best results listen to in a dark room and enjoy the journey."